Met Eireann's forecast for the Bank Holiday weekend means that Ireland will enjoy long spells of warm, dry and sunny weather with temperatures rising to the low 20s. There was a chill in the air on Friday morning as commuters made their way to work ahead of the three-day weekend but conditions are set to get progressively warmer. In fact, the forecast is that this Bank Holiday weekend will be a scorcher. Friday afternoon will see the weather pick up and nationwide temperatures climb to between 14C and 20C, although there will be a mix of cloud and sunshine. 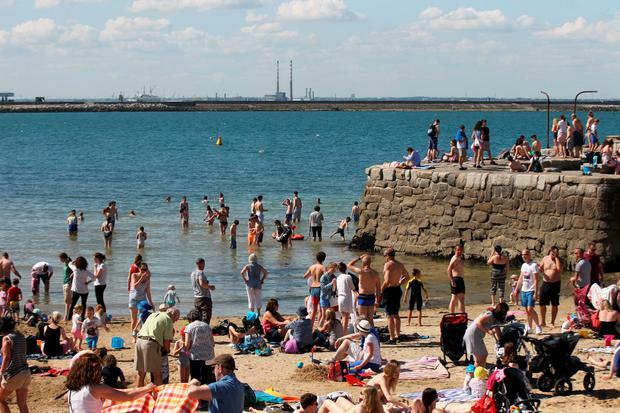 Dublin will see top temperatures of between 17C and 19C by the afternoon. Temperatures will dip overnight to between 7C and 11C with patchy mist and drizzle affecting Atlantic and southern coastlines overnight. Saturday will start off cloudy in many areas with patchy drizzle, mist and fog in places but it will soon brighten up with sunny spells on the cards. It will feel humid with temperatures ranging from 14C to 20C. The midlands, east coast and Dublin will see the best of the weather with temperatures expected to reach 21C degrees, making those regions hotter than Ibiza, Lanzarote and Barcelona. Sunday will feel slightly cooler near coastlines with top temperatures of 14C and 16C in those areas but highs of 19C to 21C and prolonged spells of sunshine is predicted for inland regions. Winds will be mainly light. It will be dry again for Bank Holiday Monday and Met Eireann has said that there will be "plenty of sunshine on offer". Highs between 20C and 21C with light, southerly winds are expected. Tuesday will see a band of rain arriving in Atlantic coastal counties during the morning, "signalling the transition to cooler and more unsettled conditions for the rest of the week", according to Met Eireann. So make the most of the sunshine this weekend.